W12 music is a shop selling a variety of quality musical instruments in Shepherds Bush, London. We stock acoustic and electric guitars, electronic keyboards, mandolins, ukelele's, dj equipment such as turntables, amplifiers, guitar fx units, audio leads, guitar strings, headphones, disco lights, percussion instruments such as bongo drums, Latin drums, djembes, darbuka, tambourines, ethnic percussion, maracas, cabases, congo, harmonicas. 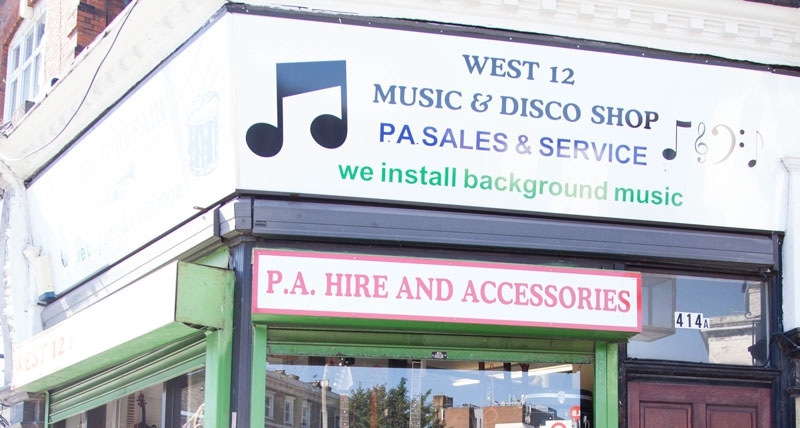 W12 Music and Disco AKA The Audio Repair Shop has been established since 1987. We are a 'small business' and we pride ourselves on the friendly and efficient service we strive to provide for all our customers, large and small. We are located on busy Uxbridge Road, W12 with easy access by public transport as well as nearby parking facilities for the private motorist. We specialise in the repair of the full range of valve amplifiers and pre-amplifiers. We also repair the range of Mosfet-based power amplifiers. together with mixers and X units. Basically we provide a service for all musicians and D.J.'s. We also cater to the public with service to domestic hi-fi equipment. Our stock consists of partly used products, but mostly new stock. A bargain basement is accessable through the main showroom, for second-hand stock. We also have a wide range of power amplifiers in stock as well as loudspeakers, mixers and general audio accesories for musicians and DJ's alike.